Posting Phoenix Bail Bonds with a credit card is becoming increasingly more popular, particularly with out-of-state clients. Maricopa County Bail Bonds handles many of these transactions throughout the week. 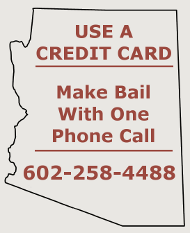 The appeal of using a credit card on Phoenix bail bonds is many-fold, particularly if the entire bail amount is charged on the card. Transactions can be handled long distance; travel to and from the bail office or jail is unnecessary. The client avoids the traffic and the summer heat of Phoenix. Bonds posted with a credit card can save you money. Phoenix Courts are requiring cash only bonds on many of its charges, including child support warrants and drug arrests. Cash-only bonds are charged a higher fee than the usual surety bond if cash is put up by the bail bond company. Using a credit card for the entire bail amount will save you a bundle on fees and it may be the only option available if you don’t have all the cash. The final advantage of using a credit card on bail bond transactions is the return of funds. Once the Defendant’s case is completed and the bond exonerated, the bail amount is returned to the card holder (premium fees are retained). Clients do not have to struggle with getting titles and deeds put back in their names or worry about lien releases. If the client was making payments on the credit card, the card can now be paid off, or the cash used as they see fit. Maricopa County Bail Bonds would be happy to discuss your needs on Phoenix bail bonds, call (602) 258-4488.